Steward First Class Carl Clark waited 66 years for this day. It's been years since the 95-year-old last wore his uniform - which has only been made complete today with the addition of a medal he won when he was 29. 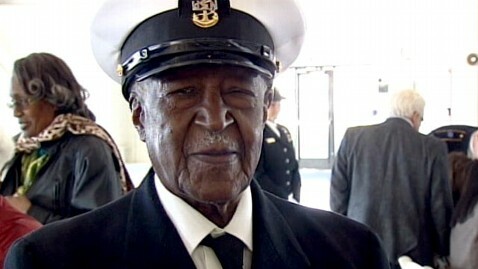 During World War II, black men were allowed to enlist, but the only job available to them in the Navy was as stewards. "Taking care of officers, feeding them their meals, cleaning their rooms, shining their shoes," were just a few things that were part of the job, according to Clark. When the ship was under attack, however, they joined their fellow soldiers, manning their battle stations like the rest of the crew. They did just that on May 3, 1945, near Okinawa on board the USS Aaron Ward. "Our ship had been hit by nine kamikazes," Clark said in a film. "All four of the other ships in our station were sunk." Clark's job was to fight the fires on deck and to help the wounded. "When first plane hit, I was blown against the overhead I broke my collarbone," he said. " I was the only survivor of an eight-man damage control team. But two minutes later a second plane came in. I stared at the pilot as he guided his plane toward our ship … the explosion blew me into the air to the other side of the ship." Singlehandedly, he kept the fires from reaching the big guns - saving the ship from exploding. They lost 40 men that day, but while his white comrades received medals for bravery, Clark did not, even though the ship's captain felt he deserved it. Clark's story came to the attention of Rep. Anna Eshoo, who pushed the Navy to acknowledge him for his bravery. They were able to finally set it right today with an appropriate ceremony. The secretary of the Navy pinned the medal - the Navy and Marine Corps Commendation for valor - on Clark himself. Clark didn't think he'd live to see the day. "It was a different country then," he said, sadly understanding the slight. "Things have changed." Now, he's amazed by the attention he's being paid. "All these people and the applause - it's overwhelming," Clark said.